In a survival situation, knowing how to perform key skills can make all the difference in the world. Knowing how to siphon gas can be a very valuable skill if you ever find yourself in a tough spot. In a more real world example - Imagine this: You're driving along on a cross-country road trip when your car is running low on fuel so you decide to stop at a gas station. You pull up to the pump, insert your card, pick up the nozzle and start filling up your tank. Things are going well until you look at the pump and realize that you’re pumping diesel into your gasoline car. For many people, this would be a major issue. Luckily, you know how to siphon gasoline - or in this case, diesel - and you have the right tools with you for the job. Many people think that siphoning fuel is for petty criminals who want to steal gasoline from other cars. However, the ability to siphon fuel can be an incredibly useful skill, whether you’ve accidentally put diesel in your gas tank or a major emergency has wiped out power in your area and you have no other way to get fuel. Most people don’t know how to siphon gas, or even where to start. That’s why we’ve created this step-by-step guide to siphoning gas so you can be prepared for whatever may happen. Before we get into the nitty-gritty of siphoning gas, there are a few things we should discuss. First, it’s important to note that some of the methods described here won’t work on all gas tanks. These days, many tanks are fitted with special anti-siphoning devices, which are designed to prevent criminals from stealing fuel, but unfortunately also prevent people from siphoning gas for other reasons. Many of these barriers can be held open by a screwdriver, so it's important to see what your car has so you're not surprised when a gas siphoning situation arises. Second, everyone considering siphoning gas should understand that both gasoline and diesel are dangerous materials to handle. Swallowing either substance or inhaling too many fumes can cause serious health problems that require medical attention. Moreover, we want to avoid spilling gasoline or diesel as it can cause serious environmental impacts. Finally, it's important that you only transport gasoline or diesel in closed containers designed for this purpose. It's dangerous to transport fuels in buckets or open containers, so only use specially-designed fuel canisters. There are a number of gasoline siphoning techniques, each of which has its own benefits and drawbacks. Most people use one of three methods - traditional mouth siphoning, siphoning with a pump, and siphoning using pressure. In this article, we will cover how to siphon with a pump and siphoning using pressure. We will not cover traditional mouth siphoning as it is dangerous and can easily lead to swallowing or breathing in gas or gas fumes which can cause potentially life-threatening medical problems. We do not recommend traditional mouth siphoning for any purpose and strongly advise against its use. Especially since the proper tools and so cost effective and easy to store ahead of time! Siphoning gas using pressure is a simple, yet effective way to siphon gas using minimal specialized equipment. To use this technique, you'll need to acquire 2 lengths of 1-inch diameter clear plastic tubing. One of these tubes should be long enough to reach deep into the gas tank while the other only needs to reach just inside the tank. Feed both of the tubes into the gas tank. First, push one end of the longer tube into the gas tank so that it is fully submerged into the gasoline. The other end of this tube should be in an empty gas can, which should be placed on the ground below the gas door. Push the shorter tube into the gas tank so that it sits in just a few inches of gasoline and so that both tubes are next to each other. Use a rag or old cloth to create a seal around the plastic tubes. You’ll need to create a high air pressure situation inside the gas tank so that you can force the gasoline into the longer tube and into your empty gas canister. The only way this can happen is if you create a tight seal around the tubes and the opening of the fuel tank. If you’re finding it difficult to create a tight seal, consider using a damp rag, which can be more effective than a dry one. Once you've created a tight seal, you'll blow into the shorter tube. This should create enough pressure to force the gasoline up the longer tube and into the gas canister. When blowing into the tube, be sure not to breathe in through your mouth as this will cause you to inhale fumes. If you're having trouble with this, chances are that you do not have a tight enough seal around the tubes. Eventually, the gas should start freely flowing into the empty canister. Once you have a steady stream of gas, you can stop blowing into the tank as gravity and pressure will do the work for you. 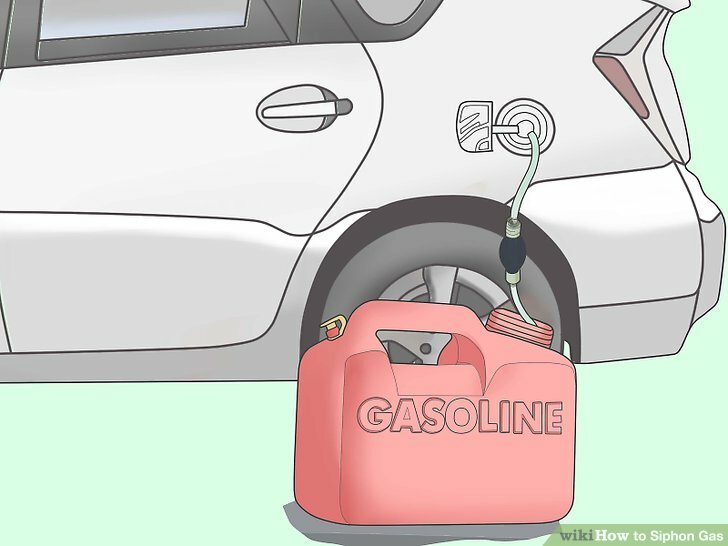 When you want to stop the flow of gasoline, put your thumb over the tube opening, raise it above the height of the gas tank and wait for the fuel in the tube to drain back into the tank. If you’re finding that the excess gas won’t flow back into the tank, then try removing the tight seal around the tubes. This technique is very similar to the pressure method, but instead of using your breath to push the gas out of the tank, you use a gas siphon pump. To use this technique, you'll have to get a siphon pump, which can be bought commercially here. They come in a variety of models, some of which are mechanic and others require hand pumping. However, they generally function in a similar way. Siphoning using a pump allows you to siphon gas without ever exposing yourself to gas fume, so it's a great option for people who siphon regularly or for particularly cautious people. Place an empty gas canister on the ground below the tank. Insert the siphon pump tubing into the fuel tank and place the other end into the canister. Siphon pumps are one-way devices, so be sure you place the correct tubing end into the fuel tank or you'll simply pump air into your tank instead of gas into the canister. Pump the gas into the canister by following the manufacturer’s directions. Every pump is different, so it’s important to read the instructions before pumping for the first time. When you're close to filling up your gas canister, raise the end of the tube above the level of the gas in the tank so that any leftover gas drains back into the tank. Remove the pump from the tank and be sure that it is free from excess gas. Clean the pump, if necessary, using the manufacturer’s directions. Generally, you can simply pump soapy water into the tube and let it dry. If you follow the above steps for either the pressure or the gas siphon pump you’ll be able to effectively siphon gas in a pinch. Be sure to have the proper tools at home in case of an emergency and if you have a desire, you can practice on your own car! Final note - in case you find yourself siphoning gas from a newer modern car, check out the graphic below for details on how to get past the anti-siphon flap.